In a fantastical version of ancient Egypt, the gods live among humans as nine-foot-tall giants who bleed gold and can turn into massive, armoured creatures at will. When Osiris (Bryan Brown), son of the mighty Ra (Geoffrey Rush) and king of Egypt, passes the throne onto his son, Horus (Nikolaj Coster-Waldau), his brother Set (Gerard Butler) usurps the throne, killing Osiris and transforming Egypt into a land of slavery and turmoil. Horus, now banished and deprived of his all-seeing eyes, has to rely on the help of a common thief, Bek (Brenton Thwaites), to steal back his eyes, recapture the throne, and set Egypt back on its proper course. From the skintone of its cast to the cheesy storyline, Gods of Egypt tries hard to be a throwback to B-movies of yesteryear, the types of films where Hollywood character actors would dress up in silly costumes, speak with British accents, and play out ancient myths over a backdrop of special effects. 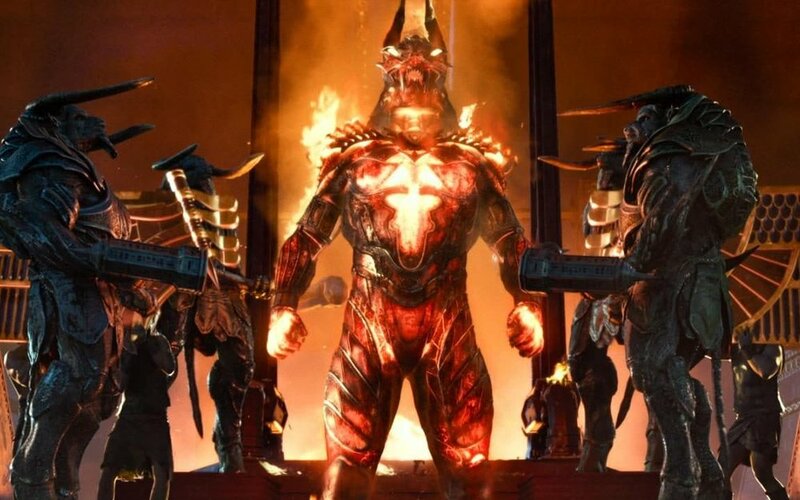 As such, there’s a lightness of tone to Gods of Egypt that makes up for some of its many deficiencies. It’s not dreadfully-made, and as far as fantasy films go, it’s certainly no disaster like the Wachowskis’ Jupiter Ascending from last year. But it’s also a little lifeless, especially in the early moments where it’s unclear who the protagonist is and why the viewer should care about him. This first point is especially a problem, as Horus and Bek share equal screen time but are both denied any meaningful character arcs. Horus starts the film as a layabout son, enjoying a pampered lifestyle full of wine and beautiful women. But he’s quickly robbed of his leisure and forced to become a hero to save Egypt. As such, since his old self is never adequately developed, his redemption is robbed of its importance. And the Bek we meet in his first frame is exactly the same as the Bek we leave in his last: impish, optimistic, resourceful, and devoted to his love, Zaya (Courtney Eaton). Because the characters are so flat, the storyline so rote, and the visual effects so unimpressive, Gods of Egypt becomes a film that defies any meaningful engagement. There are a few glimmers of enjoyment throughout. The cast does its best with the silliness of the material. Gerard Butler has fun with the absurd evilness of Set, while Chadwick Boseman makes the most of his scant screentime as Thoth, god of Wisdom, trying admirably to steer the character away from stereotype. Horus and Bek’s chemistry grows throughout. At the end, you can get a glimpse of the easy-going adventure film this was meant to be. But director Alex Proyas does little to enliven the routine of the material; his visuals are bland and the pace slogs. Even Louis Leterrier’s insane Clash of the Titans remake is more entertaining. Nikolaj Coster-Waldau is a charming actor worthy of being a big star, but Gods of Egypt isn’t the Hollywood star vehicle he deserves. Directed by Alex Proyas; written by Matt Sazama and Burk Sharpless; starring Nikolaj Coster-Waldau, Brenton Thwaites, Elodie Yung, Courtney Eaton, Chadwick Boseman, Geoffrey Rush, and Gerard Butler.